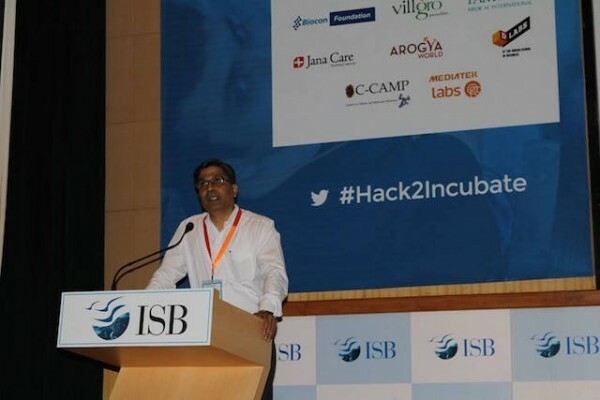 Committed to the concept of ‘Make in India’ and sourcing local health innovation, the Consortium for Affordable Medical Technologies (CAMTech) at Massachusetts General Hospital Global Health, introduced path-breaking solutions at the CAMTech Diabetes Innovation Hack-a-thon at the Indian School of Business (ISB) in Hyderabad. 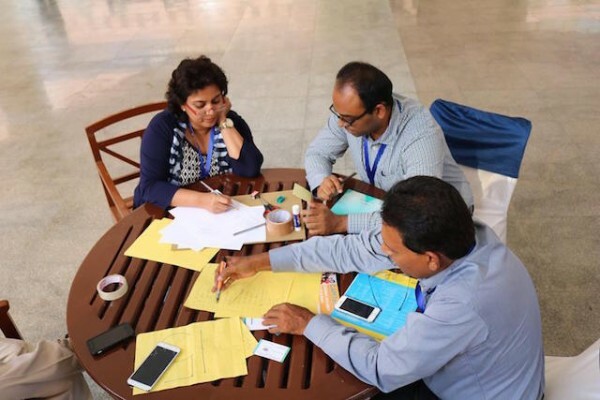 The event brought together over 200 participants, industry mentors and organizers to develop innovative and affordable health technologies that can improve the prevention, diagnosis and management of diabetes in India. The event also included keynote speeches from distinguished leaders from the Indian healthcare industry, who challenged participants to focus on specific, diabetes-related problems, such as access to care, affordable treatment and a lack of awareness and education about diabetes. 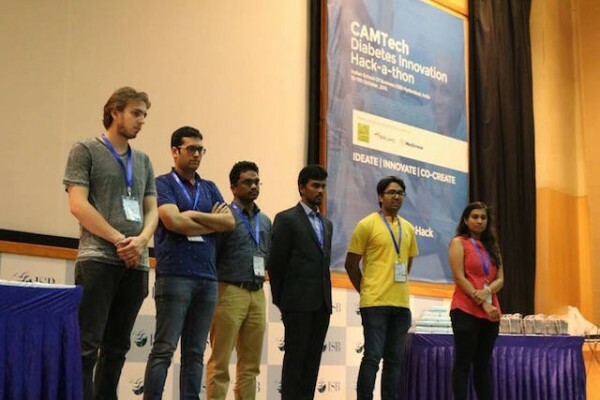 $1,000 CAMTech Grand Prize: Team Cheeni Kum – a multi-parameter early screening and detection tool to help diagnose diabetic peripheral neuropathy. 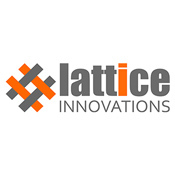 $1,000 Marico Innovation Foundation First Place Prize: Team E Stick – a non-invasive device that uses infrared light to measure blood glucose through the earlobe. $500 CAMTech First Runner-Up: Team Cool Guys – a reliable, reusable, affordable and user-friendly storage case that keeps insulin pens refrigerated through the use of an organic gel. $250 CAMTech Second Runner-Up: Team Aankhey – a mobile application that helps doctors and paramedics diagnose and raise awareness about diabetic retinopathy. These challenges were sourced from our network of clinical partners, including Apollo Sugar Clinics, L.V. Prasad Eye Institute, Biocon Foundation, Madras Diabetes Research Foundation and other experts and healthcare professionals specializing in diabetes care in India. Routine monitoring of blood glucose is a key aspect of diabetes management. The frequency of intended monitoring varies based on what the doctor prescribes. Current blood glucose meters require patients to prick their skin with a lancet, squeeze out a drop of blood, and apply it to a test strip. This pinprick deters patients from testing their blood routinely. Second, this patient has to share this data with his/ her care provider. Currently, patients predominantly maintain written records. This is a tedious and error-prone process. Click here to learn more about this challenge, including how it affects patients and existing solutions and limitations. Diabetic patients need to maintain strict control over their diet. It is important for them to track their macronutrient (proteins, carbohydrates, fats) consumption (proteins, carbohydrates, fats), so that they can keep their blood glucose levels in check. Hence, there is a need for diet planning tools that can translate commonly available foods to their constituent macronutrients. This problem is exacerbated in India due to social and religious reasons – which limit they types of foods available to diabetics. None of the current diet management solutions are designed for Indian palates. Current solutions are based on western diets (avocado & ham sandwiches, anyone? ), and fail to cater to regional dietary preferences across India. Diabetic patients require routine guidance & therapy, for which they traditionally approach doctors. However, the paucity of doctors in India the limits the time/ access that doctors can provide to patients. This may lead to inadequate service delivery to patients. Second, diabetic patients can face life-threatening emergencies due to hypoglycemia or hyperglycemia. The current system of in-person hospital visits is not equipped to provide timely support in such cases. Diabetic patients are different from most patients who enter a hospital. The latter come for a cure; diabetic patients, on the other hand, have to be counseled on how to manage and live with their chronic disease. Apollo Sugar clinics have observed that when diabetic patients have access to social supports, they are more likely to make positive changes to their lifestyle/ adhere to medical protocols. Hence, there is a need for a system that provides a social support mechanism to diabetic patients – where they can draw upon each other’s experiences and feel more empowered to manage their disease. Such systems should also extend to the family caregiver (such as the spouse or child), so that they are better prepared to offer support. Such systems should also allow diabetic patients to set goals (such as fat loss and better diet control), share with the community, and draw upon others’ support and advice. Patients claim they were not aware that they should get their eyes checked as soon as they have been diagnosed with diabetes. In fact, they claim they were never told that diabetes can affect their eyes. General physicians/internist may not be educating patients about eye health in general among diabetics. Coordination between internists and ophthalmologist must improve. Patients with diabetes check their blood sugar once in a month (paying patients), or once in 3 months (poor category patients). Many patients do not have a family physician who can manage their diabetes. They are unable to visit a trained physician regularly. Patients think taking medicines/pills can take care of diabetes and avoid all complications. They do not realize that monitoring the blood sugar and keeping it under control is equally important. Even where there is awareness, there is neglect of actively caring for the disease. Near relatives of hospital staff (clinical/paraclinical staff), who come in contact with patients every day, neglect the disease. Awareness may be present, but the will to follow through is lacking. Is it fear of some disease, is it stigma -- we do not know. Lack of awareness and neglect exist together. Many specialists in an eye institute do not refer patients with advanced diabetic retinopathy to retina colleagues in a timely manner. There is a lack of confidence that someone can avoid complications. There need to be easy-to-access to core standards. Diabetes needs to be managed at the community level, since opportunistic screening and treatment will not help to control the epidemic. Diabetes is a part of the spectrum of lifestyle diseases and for optimal control and prevention of complications, it is time to look at this cluster in a holistic way. Sub-centres in villages can act as great hubs for education, early screening and diagnosis, and also compliance tracking of patients. In order to create these sub-centre hubs, the ANM or ASHA requires a single tool with a DSS which will help set these communities up for patients. The latest international protocols for Diabetes management are based on the values of Glycosylated haemoglobin. HbA1c gives the average glucose levels in the blood over 4 months thereby negating the effect of sporadic fluctuations. The other advantage is that the patient does not have to be in the fasting state for this test. Unfortunately this test is limited by its cost. If a cost effective method ($1) which uses capillary blood (finger prick) to measure HbA1c can be developed, it would greatly augment optimal management of Diabetes in the community. Diabetes patients have consistent issues with the lack of feeling in their limbs - particularly their feet. This issue leads to an increased risk for the patients in everyday activities, including driving their cars as the individuals can no longer feel the pedals. To help support these patients, podiatrists have created alternative shoes that help address this issue; however, they are extremely expensive and not always available for patients. There is a large need for an alternative shoe that not only addresses this issue, but is also affordable. There is a continuing issue with availability of medication to manage diabetes in rural villages. This leads to delays in treatment for patients as health care workers in the villages are unable to provide medication to the patients and the patients then need to travel to the closest PHC. Many patients are not able to travel to the PHC due to health, transport and distance. There is a need for available medication and/or treatment for rural villages. There is a challenge across India in medication adherence for diabetes management. This is due to the lack of motivation for patients to receive regular treatment, which then leads to growing health issues with diabetic patients. There is a need to create a technology that will provide consistent motivation to patients to continue treatment. Over 30 million people in India have been diagnosed with diabetes. Although this number is substantial, there is a lack of awareness of the population for both the prevention and effects of the disease. It is important for every patient to understand that they need to manage their diabetes at home. There is a large need for meaningful education and messages to the patients especially in rural areas. Currently, there is no way to translate meaningful messages from doctors to patients in rural areas. Messages are often lost in translation and patients are not consistently updated on the developments of the disease or options for management. Nutritionists play an important role in working with diabetic patients to manage their lifestyles. Doctors in India have no current way of tracking patients or their family members to determine the risk of diabetes. This is normally based purely on the communication of patients. There is a need for an evidence-based information system for doctors to understand the risk of their patients and determine if further prevention tactics are needed. As diabetes is often genetic, there are many families as a whole that suffer from diabetes. As children are being raised in environments where their parents are not aware of diabetes management and prevention, there is an increasing amount of children being diagnosed with diabetes. It is necessary to create a solution that will address the education specifically of children to help promote health within the family system. Currently, there is a lack of integration between the groups diagnosing diabetes (ASHA Workers, and General Practitioners) and the diabetologists. There is no system in place to ensure that these patients are receiving the correct information at the right time and that there is communication between these providers. There is a lack of educational tools for individuals and a need to empower patients to change their behavior. Empathy and emotional connection can be tools for creating this change. There is a need to raise awareness/availability of healthy foods for diabetes patients. We need to take into account local eating habits, food sources, socioeconomic and cultural diversity, and religious beliefs. We need to demystify food myths and facts by hard, evidence-based facts. Glucose reading, action conversation maps, There is a need for integrated solutions for co-managing diabetes. CAMTech will award a total of $2,500 USD in prize money to the top innovations focused on diabetes management and prevention. 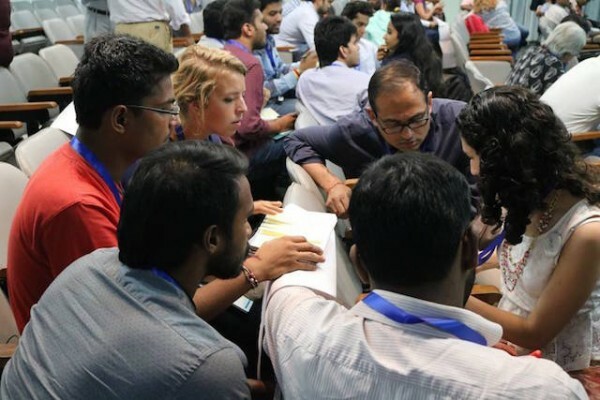 Teams will be evaluated by a panel of judges according to a specific criteria, including challenge addressed, public health impact, technology innovation, sustainable business models, team composition and overall pitch.